To date there are relatively few references and internet resources specifically organized to support Jewish heritage travel in east-central Europe, and almost none with useful and current information about sites in Ukraine; several important resources, both guides and studies, are presented here. Traditional travel guidebooks to the region, both in print and in digital form, now sometimes include sections to aid Jewish heritage travel and “roots” tourism, but most of the major travel guide series still ignore Ukraine. Some travel websites developed by both traditional publishers and via crowd-sourced wiki-style tools now include a (very) small amount of Jewish heritage content. 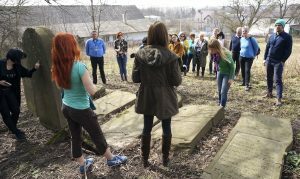 For most foreigners, Jewish heritage travel in western Ukraine will require the assistance of experienced local guides. We expect that tourism in Rohatyn and the region, both general and Jewish-themed, will continue to grow, for the benefit of local history and heritage organizations and the interested public. Ukrainians, Moldovans, Germans, and others on a tour of the Jewish heritage sites in Rohatyn, as part of a Centropa seminar for educators. Photo © 2018 RJH. Lehrer, Erica T: Indiana University Press; Bloomington, Indiana, 2013. Foreign Jews fascinated with Poland, Poles fascinated by Judaism and the memory of a people which had almost disappeared from their land. An anthropological and personal study of the growing phenomenon of Jewish heritage tourism, from the perspectives of both the tourists and the people and institutions interacting with them. Gruber, Ruth Ellen; National Geographic; 2007. Covers more than a dozen countries, and expanded and updated from continued travel and research since the first edition which appeared shortly after the fall of the Soviet Union. Comprehensive descriptions and reviews of hundreds of sites in cities and villages, the book serves as a guide both to specific places and to Jewish culture and history in the region. Spanning a large geographic area with significant variety, the forty pages on Ukraine are necessarily limited, but in addition to sites in and around major eastern and central cities, much of the text is concentrated on western towns in former eastern Galicia (including among others Rozdil, Stryi, Bolekhiv, Drohobych, Staryi Sambir, and Lviv, all near Rohatyn). Sections on adjacent countries (especially Poland and Romania) provide useful context and comparison. Di Duca, Marc, Greg Bloom, Leonid Ragozin; Lonely Planet Global Limited; London, 2018. The index to this traditional travel guidebook lists nine cities with Jewish sites; Lviv is omitted from this index list but Jewish Lviv gets almost a full page in the main text with ten featured sites including pre-war, wartime, and of the contemporary Jewish community. Readers are directed to prominent Ukrainian Jewish sites in the introductory highlights section “If You Like…” and in the colorful section on “Ukrainian Gems” in a top-5 list describing Ukraine’s “Cultural Tapestry”. Chernivtsi gets a smaller but similar treatment in the text. Jewish cemeteries are listed and briefly described for several towns. Evans, Andrew; Bradt Travel Guides Limited; Chalfont St. Peter, 2013. A traditional travel guidebook which is sensitive to Ukrainian Jewish history and surviving physical heritage. Includes a good introduction to the unique nature of Galicia and Volhynia, and details Jewish cemeteries, synagogues, and other sites in many towns and cities, along with cultural sites of other faiths and ethnic groups. Focused primarily on major cities and perhaps slightly dated because of recent political changes in Ukraine and at its eastern border, the book is nonetheless a very good introduction to how surviving Jewish heritage fits into the overall cultural landscape of Ukraine. Walkowitz, Daniel J.; Rutgers University Press; New Brunswick, 2018. A survey and critique of the Jewish heritage tourism business as it appears in museums and walking tours in eleven cities across eight countries of Europe and the United States, building from the author’s historical family connections to some of the locations (including eastern Galicia) as a starting point. Although sharply focused on the (lack of) presentation of 19th- and 20th-century Jewish political and social justice movements, the study addresses broader concerns about contemporary Jewish heritage tourism including the primacy of the Holocaust in historical narratives and exhibitions, a prioritization of religious material heritage (synagogues and cemeteries), the absence of women and poor Jews as subjects of many tours, and a widespread silence on the changing historical spectrum of Jewish ethnoreligious identity. Majuk, Emil, ed. ; Brama Grodzka – Teatr NN; Lublin, 2017. Specifically focused on the smaller and lesser-known “shtetls” of the borderlands spanning eastern Poland and western Ukraine and Belarus, the guide introduces the history and heritage of more than 60 places, a third of them in Ukraine (including Rohatyn) which were settled by a majority or significant minority of Jews before World War II. Using excerpts from Yizkor books and other sources to provide historical context, each town or village is described and in detail and annotated with a list of heritage and other interest sites both in the settlement and in the surrounding area. Richly illustrated with old and new photographs and supported with maps to key sites in each location. A cross-border project to document and promote the mixed cultural heritage of Polish, Ukrainian, and Belarusian borderlands, Shtetl Routes is gathering and building a wide variety of historical material on towns and communities in the region. The goal of the project is to develop narratives and tools that can be successfully used in tourism, and to support local development. Planned and ongoing projects include research expeditions to inventory Jewish heritage sites, virtual tourist trails covering Jewish heritage sites, digital reconstructions of historical towns, guidebooks, and training sessions for local guides. Already the web site includes photo essays and other information about the city and history of Rohatyn (with far more historical information available in the Ukrainian version of the site). A blog-format website by the heritage and travel author Ruth Ellen Gruber, which functions as a dynamic supplement to her guidebook (above). A side bar includes links to a large number of Jewish heritage travel resources and guides. An online virtual walk and a component of the Lviv Interactive project of the Center for Urban History of East Central Europe in Lviv, this responsive page follows a path among vestiges of the Jewish cultural, religious and political sites in western Ukraine’s most-visited city. The layered history of each stopping point is described in clear text, with images, maps, audio, and video complementing many of the sites. Other walking tours on the Center’s website also include elements from Lviv’s prominent Jewish past. A genealogy researcher and family history tour guide based in Lviv, with experience in archives and on-site research in Ukraine, Poland, Belarus, Moldova, and beyond. Very knowledgeable in the multicultural history of the region, and skilled at working sensitively with local administrations, residents, and businesses to aid research and explore the hidden stories of people and places. Alex has conducted genealogy and history research for many institutions and hundreds of individuals, and has provided essential support to our heritage project since its beginning in 2011. Historians and independent researchers who specialize in Jewish family research, with particular focus on Ukraine and Poland. Experienced tour guides on both sides of the modern border, Tomasz and Lada link scraps of family history to records and maps, to uncover genealogy, local history, and the residual traces of stories still living in ancestral cities, towns, and villages. A commercial travel agency based in Lublin, Poland, focused on Jewish heritage sites in eastern Poland and western Ukraine. Affiliated with the Brama Grodzka – Teatr NN history center and with skills and knowledge researching Jewish genealogy, the team already has close to a decade of experience connecting culture to people and places. A commercial heritage tour company based in Poland and affiliated with the Taube Center for the Renewal of Jewish Life in Poland. Offers standard and customized tours of Jewish heritage and revival sites in Poland, and a specialized tour which includes sights in western Ukraine. A commercial culture and heritage tour company based in Lviv, with an interesting and useful way to introduce visitors to the city: free walking tours. 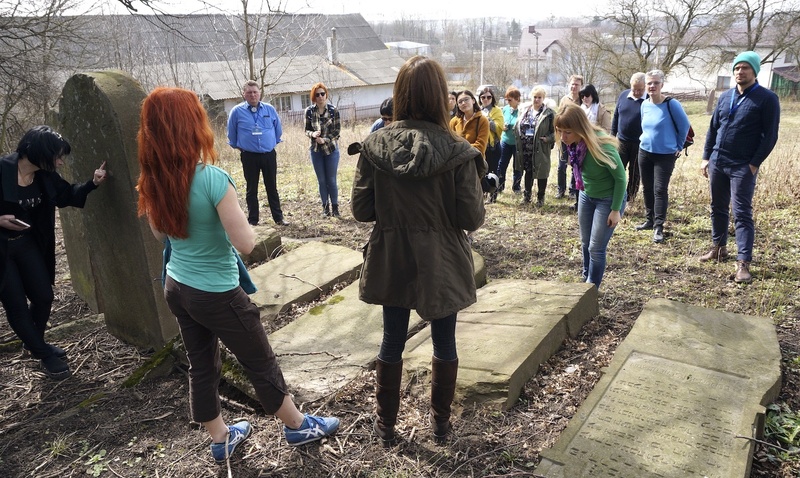 Daily free tours cover the essential sights, cultural gems, and hidden secrets, while a wide variety of different fee-based private walking tours focus on specific perspectives on Lviv, including its Jewish history, Ukrainian foods, street art, or extended guided visits to Lviv’s folk architecture museum and its multicultural outdoor art museum: Lychakiv cemetery. A crowd-sourced and -edited wiki website under the umbrella of the Wikimedia Foundation. Its section on western Ukraine is small but well-structured, and the few cities listed each have generally good content. All of the cities currently listed (early 2019) had large pre-war Jewish populations and most have current active Jewish communities. Pages for major cities such as Lviv present good multicultural histories, and list some Jewish heritage and memorial sites among the sightseeing itineraries. The page for Chernivtsi lists five current and former synagogues worth visiting, and prominently features the Museum of Bukovinian Jewish History and Culture. Other city pages may mention a current or former synagogue, but omit other Jewish heritage sites within the city and in the surrounding towns and villages. This website appears to have potential for raising the visibility of Jewish heritage as a tourist track in western Ukraine. A crowd-sourced and -edited wiki website, and the predecessor to WikiVoyage (above). Its section on western Ukraine appears promising, but few of the cities covered have any Jewish history or heritage content, even those with large pre-war Jewish populations and contemporary Jewish communities, such as Lviv. The former synagogues in Terebovlia are described, as is a Jewish memorial; a brief overview of the Jewish history of Chernivtsi is accompanied by a listing of one of the former synagogues and a more detailed summary of the Museum of Bukovinian Jewish History and Culture. WikiTravel acknowledges that their coverage of western Ukraine is sparse, and asks for help to fill out the site. A travel booking website which includes general introductions to locations and sights as a means to direct users to lodging, attractions, and tour guides. Where there is sufficient existing interest in Jewish heritage sites (e.g. the Jewish portions of Lviv’s old town), local guides list their services on the website along with a summary of the tour’s itinerary. Can be useful for tours to smaller heritage sites outside of major population centers and which otherwise may be difficult for visitors to reach. Includes a voluntary user rating system.